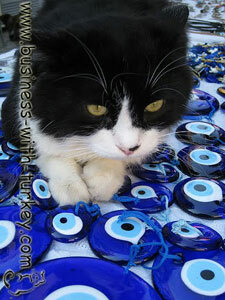 This amulet against evil eye is very typical in Turkey. You can find it all over Turkey: women use it as a bracelet, earring or necklace; Turkish people use it hanged in their house, office and also at their car, also babies have it hanged in their cloths. It should be mainly blue and look like an eye. There are very different sizes but the shape is usually round. The Turkish name for this amulet that protects one from the evil eye is nazar boncuk. This one that you see on this page is the most original turkish evil eye amulet and can be hanged at your house, office, car or anywhere else you want to protect from bad energy ! Transportion: All our products are original from turkey and are delivered directly from Istanbul - Turkey by airmail and the transportion takes approximately 10 days to reach Europe and 15 days to reach South and North America, Asia and all other countries. Transportation is included in the price of the product. Click here to shop original articles from Turkey !